New York: Ecco Press, 2007. Early printing of the 50th Anniversary edition of Cohen’s first book. Octavo, original boards, illustrated by Freda Guttman. Signed by Leonard Cohen on the title page. Fine in a fine dust jacket. 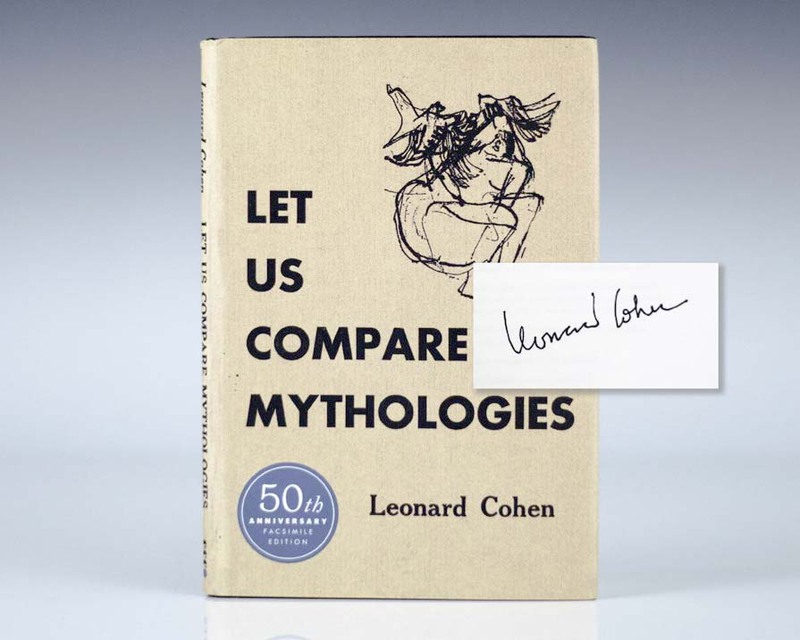 When Leonard Cohen published his first book, Let Us Compare Mythologies, he had already received prestigious awards for his poetry, which, from the first, revealed his abiding interest “in mythology and magic… The first poem in Let Us Compare Mythologies, ‘Elegy,’exhibits a number of characteristics which recur throughout his work: his almost magical control and modulation of verbal melody, his sensuous particularity, the empathetic reach of his imagination and his fascination with situations which mingle violence and tenderness to heighten the effect of both. We also see emerge for the first time the theme of the quest—here as usually in Cohen the quest for a lost or unknown God, mysterious, elusive, but compelling” (Pacey, Phenomenon of Leonard Cohen, 5-6). Leonard Cohen. Songs of Love and Hate. Original lp vinyl record of Leonard Cohen’s third album Songs of Love and Hate, boldly signed by him on the front panel. Produced by Bob Johnston, the album was released on March 19, 1971, through Columbia Records. The album reached no. 145 on the US Billboard 200, but was his most commercially successful album in many other parts of the world, reaching no. 4 in the UK and no. 8 in Australia. Writing in 2011, Cohen biographer Anthony Reynolds noted, “In some quarters it was the album that seemed to seal Cohen’s reputation as being something of a downer, to say the least.” In his review of the 2007 reissue release, Tim Nelson of BBC Music stated that Cohen’s third LP “is perhaps less varied than the first two albums, but the focus is more intense and the sequencing superb. Be warned though: this is one of the scariest albums of the last forty years…” Mark Deming of AllMusic calls Songs of Love and Hate “one of Leonard Cohen’s most emotionally intense albums – which, given the nature of Cohen’s body of work, is no small statement.” In 2012, Rolling Stone ranked the album no. 295 on its list of the 500 Greatest Albums of all Time, the only Cohen album to make the list. It was ranked no. 74 on Pitchfork Media’s 2004 list of the 100 best albums of the 1970s. “Famous Blue Raincoat” was voted #3 by in a Rolling Stone readers poll of the top ten greatest Leonard Cohen songs. In near fine condition. Framed. Toronto: McClelland and Stewart, 2006. First Canadian edition, preceding the American first of Cohen’s provocative book of poetry. Octavo, original black boards, illustrated. Signed by Leonard Cohen and Philip Glass on the title page. American composer Philip Glass is widely regarded as one of the most influential musicians of the late 20th century. Glass collaborated with Cohen on the musical performance adaptation of Book of Longing which premiered in June 2007 in Toronto. Glass composed the piece for seven instruments and a vocal quartet, is additionally contained recorded spoken word performances by Cohen and imagery from his collection. Fine in a fine dust jacket. Stranger Music: Selected Poems and Songs. Toronto: McClelland & Stewart, Inc, 1993. First edition of this collection of poems and songs. Octavo, original cloth. Signed by Leonard Cohen on the title page. Fine in a near fine dust jacket. Jacket design by Kathleen DiGrado. Jacket photograph by Edward Gajdel. New York: Welcome Enterprises, 1995. First edition of Cohen’s work, a lyrical tribute to love. Thin quarto, original illustrated boards. Paintings by Henri Matisse. Edited by Linda Sunshine. Association copy, inscribed by the author to Judy Collins on the front free endpaper, “Dear Judy thank-you for shameless love, as always Leonard Los Angeles 1995” with Cohen’s “Order of the Unified Heart” ink stamp, his embossed stamp, and Collins’ signature above. Collins was essentially responsible for Cohen’s musical career. As she writes in her autobiography Trust Your Heart, “I met Leonard Cohen in 1966, when my Canadian friend Mary Martin arranged for us to meet. Leonard had been a published and successful writer and poet for many years, and had recently written his first songs. He came down from Canada one night, and I listened to his songs in my living room. He sang ‘Suzanne’ and ‘Dress Rehearsal Rag’ that night, sitting on the couch, holding the guitar on his knee. I was moved by his singing voice, and by the songs, and by his whole presence. There was something very ethereal and at the same time earthy about his voice. When Leonard sang, I was entranced. I became immediately devoted to him, and we soon were friends… I recorded ‘Suzanne’ and ‘Dress Rehearsal Rag’ on In My Life in 1966, and it went gold in 1967. With the record’s success, Leonard became known as a songwriter. I suggested he make his debut and sing in public, but he was terribly shy. I knew once he got over his fear, he would be powerful on stage. I was going to appear at a concert for Sane against the Vietnam War at Town Hall, on April 30, 1967. I asked Leonard if he would sing Suzanne there. ‘I can’t do it, Judy, I would die from embarrassment.’ ‘Leonard, you are a great writer and a fine singer, people want to hear you.’ He finally agreed, reluctantly. When I introduced him, he walked onto the stage hesitantly, his guitar slung across his hips, and from the wings I could see his legs shaking inside his trousers. He began ‘Suzanne,’ with the hushed audience leaning forward in their seats; he got halfway through the first verse and stopped. ‘I can’t go on,’ he said, and left the stage, while the audience clapped and shouted, calling for him to come back. ‘We love you, you’re great!’ Their voices followed him backstage, where he stood with his head on my shoulder, my arms around him. ‘I can’t do it, I can’t go back.’… He looked about ten years old. His mouth drew down at the sides, he started to untangle himself from his guitar strap. I stopped him, touching him on the shoulder. ‘But you will,’ I said. He shook himself and drew his body up and put his shoulders back, smiled again, and walked back onto the stage. He finished ‘Suzanne,’ and the audience went wild. He has been giving concerts ever since. I have loved and recorded so many of his songs… His songs carried me through dark years like mantras or stones that you hold in your hand while the sun rises or the fire burns. They kept me centered as I stood in front of thousands of people, my eyes closed, my hands around the neck of a guitar, my voice singing his ethereal lyrics. The audience responded to his writing, the songs were like water to a person dying of thirst. They were songs for the spirit when our spirits were strained to the breaking point.” An exceptional association, perhaps the finest possible as without Collins, Leonard Cohen musical career may not have been discovered. Near fine in a near fine dust jacket. From the library of Judy Collins. First edition of Cohen’s second and final novel. Octavo, original cloth. Presentation copy, inscribed by the author on the title page, “To William on his 60th Birthday warm regards Leonard Cohen Montreal 2008.” Fine in a near fine dust jacket with only the lightest of wear. Jacket design by Gilda Kuhlman. Early printing of Cohen’s provocative book of poetry. Octavo, original half cloth, illustrated. Association copy, inscribed by Leonard Cohen on the title page, “For Janice and Bob, suffering together, Leonard Washington 2006.” The recipient, American novelist Robert Stone’s first two novels, A Hall of Mirrors(1967) and Dog Soldiers(1974) were published in the same era as Cohen’s only published novels The Favorite Game (1963) and Beautiful Losers (1966). Both author’s works have come to be seen as great reflections of the zeitgeist, and darker side, of the 1960s. Cohen inscribed the present volume to Stone at BookExpo America 2006, held in Washington D.C. Fine in a fine dust jacket. From the library of Robert Stone. A exceptional association, connecting two iconic novelists of the 1960s. New York: The Viking Press, 1972. First edition of this collection of poems. Octavo, original cloth. Signed by Leonard Cohen on the title page. Near fine in a near fine dust jacket with light wear. Jacket design by Blanche Simkin. First edition of Cohen’s work, a lyrical tribute to love. Thin quarto, original illustrated boards. Signed by Leonard Cohen on the title page. Paintings by Henri Matisse. Edited by Linda Sunshine. First edition of Cohen’s second and final novel. Octavo, original cloth. Inscribed by the author on the title page, “For Matthew all the best Leonard Cohen 2008.” Fine in a near fine price-clipped dust jacket with only the lightest of wear. Jacket design by Gilda Kuhlman. Early printing of Cohen’s provocative book of poetry. Octavo, original boards. Signed by Leonard Cohen and Philip Glass on the title page. American composer Philip Glass is widely regarded as one of the most influential musicians of the late 20th century. Glass collaborated with Cohen on the musical performance adaptation of Book of Longing which premiered in June 2007 in Toronto. Glass composed the piece for seven instruments and a vocal quartet, is additionally contained recorded spoken word performances by Cohen and imagery from his collection. Fine in a fine dust jacket. On Tour With Leonard Cohen. New York : Powerhouse Books, 2014. Octavo, original cloth, pictorial endpapers, illustrated throughout. Signed by Leonard Cohen on the title page. Photographs by Sharon Robinson. Essay by Larry Sloman. In fine condition. London: Secker & Warburg, 1963. First British edition, preceding both the Canadian and American publication. Octavo, original cloth. Signed by Leonard Cohen on the title page. Near fine in an excellent dust jacket with a touch of rubbing and shelfwear. A nice example.